As part of our series on place names in the Park author Dave Hansford takes a look at Hadfield Clearing and the family whose name Is forever entwined with it. On January 21st, 2004, a strand in a 146-year bond was broken when Bill Hadfield passed away. The last of five generations to farm the Awapoto Valley, Bill came to the 790-hectare Golden Bay property in 1950; Bill came to the 790-hectare Golden Bay property in 1950; settled into the homestead where his grandfather William brought his bride Adele in 1878. Bounded on three sides by the Abel Tasman National Park, the Hadfield block nestles between the Awapoto and Awaroa catchments, some 25 twisting kilometres from Takaka. A short walk from the front gate, the tides of Awaroa Inlet come and go. The Awapoto River flows over golden granite shingle between the flats where Bill and his forebears raised and worked Perendales. Along the western flank, the nearby sea holds the water table high, nourishing a rich pakihi swamp guarded by a phalanx of tall flax. From deep within, fernbirds call and kahikatea rickers strain for the light. The front-country hills, low and easy, hold the Awapoto and Awaroa rivers apart. 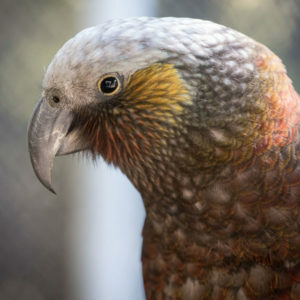 The settlers did their best to bring them in with fire and tiller, but today ranks of kanuka and tree ferns are crowding back, sheltering a future forest. Rearing up behind the sunny flats, Alma Hill, the high point at 583 metres, looks out over back hills cloaked in old-growth forest; one of the largest tracts of privately-owned forest in the Nelson region. Most of it – hard beech, broadleaf and podocarps – has never seen the saw. Such natural treasures have vanished from much of the Nelson region, so when Bill Hadfield’s children contemplated the future of Awapoto, they decided to offer the block to the Department of Conservation. 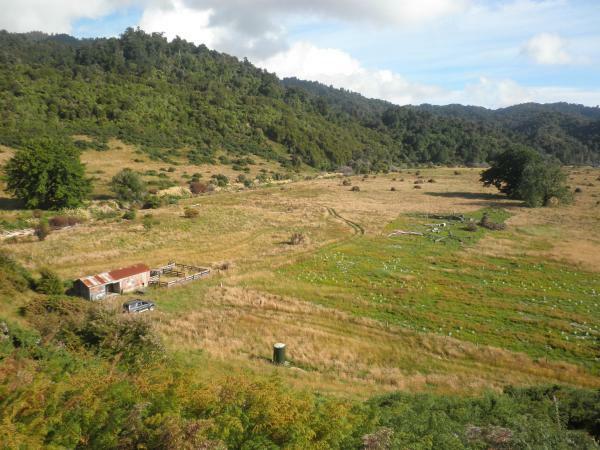 In November 2006, the Department’s Nature Heritage Fund purchased Hadfields as a scenic reserve, taking up a golden opportunity to formally protect the block’s outstanding natural values and bring the most significant remaining tract of private land into the Abel Tasman National Park. By doing so, the Fund closed a gap between the Park’s southern and northern sections, forging a link for both people and wildlife. Kahikatea were lost from much of the Nelson province, felled to provide spars for tall ships, and many that remain are threatened by drainage. But a pan of iron beneath the Sherry soils of Awapoto’s flats wets the feet of a 10-hectare stand of survivors on the block’s south-eastern margin – the nucleus of a spreading ring of saplings and now one of the most important kahikatea tracts in the district. Beyond, where the waters flow close to the surface, carpets of sphagnum moss dot the sedge rushlands, home to pukeko and paradise duck. Kahu, the harrier, floats over thickets of flax on the drier reaches, where fernbirds flit, plucking the berries from small-leaved coprosmas dotted about. This community, and the salt-marshes along the road boundary, are one of the few places left for the fernbird, a lover of the pakihi wetlands so comprehensively drained outside the Park’s boundaries. Beyond the pakihi, the young kahikatea eventually falter in the dry Separation Point granite soils of the toe slopes, yielding to the gorse and bracken that overwhelmed the failing pasture. Higher up, kanuka and mamaku follow in the wake of the clearance fires, but in the steep, south-facing gullies above Awaroa Inlet, a rich mix of coastal broadleaf trees – pigeonwood, mahoe, hinau and statuesque pukatea draped with climbing vines and perching plants – thrive in the shelter that saved them from the blazes. Here, tui squabble over summer nectar and the air thrums to the whoosh of kereru wingbeats. Rimu force their way between mature black beech straddling the dry, drought-prone ridges above. These stands are rare in the Park, where many were consumed by fire. Here too, the largest known stand of weeping inaka, a nationally-threatened dracophyllum. The largest of our narrow-leaved grass trees, it needs the dappled light and open understorey of the beech forest to survive. 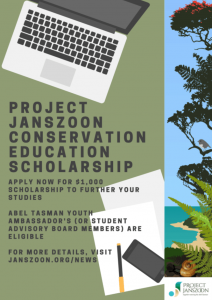 In 2014, environmental restoration trust Project Janszoon began a major ten-year planting project to extend that 10-hectare kahikatea stand to 25 hectares. As of 2018, 45 thousand of the forest giants and other suitable species had been planted. 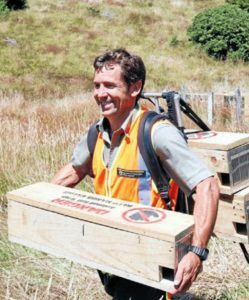 Pest control, targeting stoats and feral cats in particular, was undertaken with threatened native wetland species including the rare dabbling duck pāteke/brown teal successfully reintroduced to the area in May 2017. The bulk of the Hadfield block, though – more than 500 hectares – is steep, inaccessible back hill country, looming over the farm flats and inlet and snagging the mist carried on the norwesterly. They wear a mantle of hard beech, dotted with rimu, miro, hinau, toro and thin-barked totara. Their addition to the surrounding park makes for the region’s single-biggest continuous tract of lowland forest. This seamless boost to the Park’s biodiversity is one reason why the Hadfield block was identified in an earlier Nature Heritage Fund report as one of the highest priorities for protection in Golden Bay. The 2004 purchase of the Greenhough family property to the southwest at Canaan Downs left Hadfields as the only major private enclave into the National Park. Frederick and Ann Hadfield arrived in Nelson in October 1858, after a long, cramped voyage from London with their sons Harry and William. Five years later, Frederick bought 1000 acres of land at Awaroa, a strategic purchase lying as it did on the coastal shipping route between Nelson and Collingwood. After serving farming apprenticeships on separate Marlborough stations, William and Harry went to farm the family land at Awaroa in 1863. Both married and settled in the area, and the Hadfields worked the dry hills of Awaroa and Awapoto for another five generations. Life was typically difficult; the family’s history is underlined with hardship – Harry’s wife Annie had her ninth child in their yacht during a voyage to Riwaka in 1891 – and punctuated by tragedy. Bill’s son Gordon remembers Awapoto as an idyllic place to grow up – he and his six siblings took their schooling by mail – but even with 20th century advances, the block yielded a living only by the greatest effort and the smallest margin. As part of an arrangement with DOC the family continue to have an ongoing relationship with the site. Daughter Elaine still visits the homestead on occasion. She still enjoys the call of the ducks and the burble of the Awapoto as it glides by.